Celebrate the traditions of Chinese New Year. In most cultures, the New Year is an opportunity to begin anew with hopes of a fresh start in the year to come. During the Chinese New Year Festival, people make wishes of good fortune for their family and friends and decorate their homes with symbols of good luck, prosperity, long life, happiness and wealth. In this workshop we will learn about the folk arts associated with celebrating Chinese New Year. 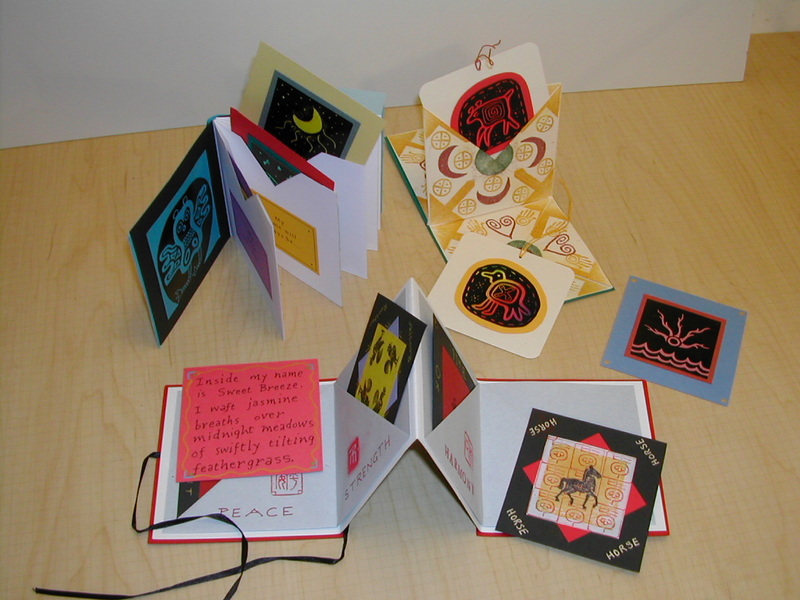 We'll make an accordion book, with attached pockets and a ribbon closure. Then we'll design a fortune card for each pocket and decorate them with Chinese characters, zodiac symbols, and wishes of good fortune for the new year. We will experiment with a variety of art materials, including rubber stamps, markers, colored pencils, paints and paper collage. Participants will be invited to trade their cards with others.